No word yet on what his next move will be — although Nina Ricci is looking likely. When it comes to the continuous cycle of hirings and firings at fashion houses, rumors often leak and spread before a brand formally announces a switch. 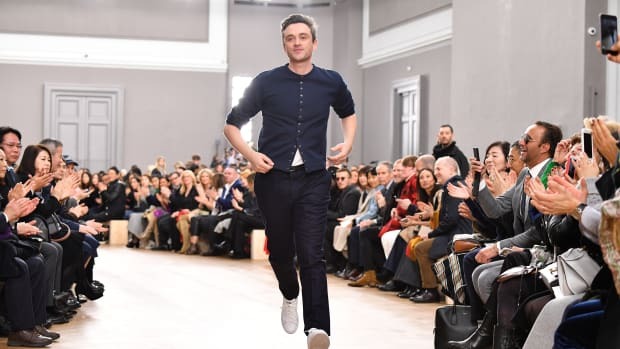 Case in point: After word broke out this weekend that Carven designer Guillaume Henry was likely next in line to take over for Peter Copping at Nina Ricci, a Carven rep has now confirmed that he will, in fact, be leaving the French label after November. Reps for Nina Ricci and for its parent company, Puig, did not respond immediately to request for comment. So that one is still up in the air. So what&apos;s to become of Carven? As CEO Henri Sebaoun told WWD, it&apos;ll be business as usual, at least from a strategy standpoint. Store openings and expansion of the company&apos;s various segments will continue on as planned. Carven is currently in talks with a number of potential replacements for Henry, who was appointed creative director in 2009. While we wait for official news on Henry&apos;s next move to drop, here&apos;s a look at his latest (and now last) Paris Fashion Week show for the brand. With its sporty, mod vibe, it&apos;s quite different from what we typically see at Nina Ricci, so it&apos;s fair to say the designer would provide a new take on the house&apos;s style as creative director. After weeks of speculation, it's official. The designer practically confirmed the news backstage at his runway show on Thursday. The creative director's Fall 2018 collection on Friday will be his last for the label after a three-year tenure. Guillaume Henry, the handsome designer behind the revival of French couture house Carven, just ended a whirlwind trunk show tour of the US, visiting Barneys New York locations in San Francisco, Los Angeles, Chicago, and yesterday afternoon, the store's Madison Ave flagship. This was the first time he's been able to meet his American customers, a rabid fan base that has grown rapidly since the label relaunched at a contemporary price point in Spring 2010. (A quick fashion history lesson: Carven began as a Paris couture house in 1945, known in the 1950s for dressing royals.) "What's interesting is that they all wear Carven so differently in each city," he told Fashionista yesterday. "They all want different things." And thus far, Henry's been able to deliver, with a mix of refined wardrobe basics inspired by 1950s couture, the era in which Carven was initially so popular. "Many of the shapes we use--the cocoon shape, the ballerina--are from that time. But we've updated them to look modern," he says. "Mrs. Carven wanted to be cool, and she was, but what was cool then is different from what is cool now. We want our clothes to be right for now." So while he's taken a peek into the archives to understand who the Carven lady was, those looks don't entirely define who she currently is. As for how the house is able to bring couture-like garments down to a contemporary price point?